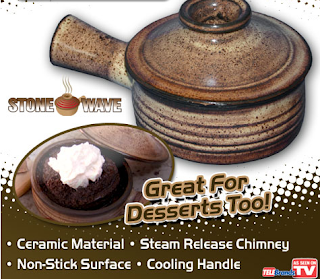 Stone Wave's non-stick surface allows you to make everything from baked desserts to eggs without fats, oils, or butter. Prepare delicious, gourmet meals in your microwave oven that your whole family is sure to love. The Stone Wave bowl is microwave safe and made from a ceramic non-stick stoneware. This allows you to not have to add butter or other fats to your food when cooking. It has a cool to touch handle making it easier to take out of the microwave when the food is done. With it's clever design and steam release chimney it helps for food to cook more evenly. You can make eggs, shrimp, fruit pies and so much more in your microwave in just a matter of minutes.